ANO 2013 TCHECOSLOVÁQUIA - A-59/60 (1963)-VÔO AGRUPADO VOSTOK V+VOSTOK VI,SÉRIE COM 2 SELOS USADOS C..
TCHECOSLOVÁQUIA - 1937 - BL-3 - 4,00 EUROS PROMOÇÃO SUPER ESPECIAL. BLOCO NOVO, CONTÉM LEVE FERRUG..
TCHECOSLOVÁQUIA - 1962 - BL-22 - 50,00 EUROS PROMOÇÃO SUPER ESPECIAL. BLOCO NOVO E PERFEITO. SE N..
TCHECOSLOVÁQUIA - 1969 - YV-1723 - 40,00 EUROS PROMOÇÃO SUPER ESPECIAL. NOVO E MINT. SE NECESSITA..
TCHECOSLOVÁQUIA - 1969 - YV-1749 - 14,00 EUROS PROMOÇÃO SUPER ESPECIAL. QUADRA NOVA E MINT. SE NE..
TCHECOSLOVÁQUIA - 1978 - BL-45 - 18,50 EUROS PROMOÇÃO SUPER ESPECIAL. BLOCO NOVO E PERFEITO. SE N..
TCHECOSLOVÁQUIA - 1962 - BL-22 - 50,00 EUROS PROMOÇÃO SUPER ESPECIAL. BLOCO NOVO E CONNTÉM FERRUGE..
TCHECOSLOVÁQUIA - 1981 - YV-2461 MINI FOLHA - 22,40 EUROS PROMOÇÃO SUPER ESPECIAL. MINI FOLHAS NOV..
TCHECOSLOVÁQUIA - 1982 - BL-52 - 15,00 EUROS PROMOÇÃO SUPER ESPECIAL. BLOCO NOVO E MINT. SE NECES..
TCHECOSLOVÁQUIA - 1982 - BL-54 - 20,00 EUROS PROMOÇÃO SUPER ESPECIAL. BLOCO NOVO E MINT. SE NECES..
TCHECOSLOVÁQUIA - 1982 - BL-57/58 - 25,00 EUROS PROMOÇÃO SUPER ESPECIAL. BLOCO NOVO E MINT. SE NE..
TCHECOSLOVÁQUIA - 1983 - BL-60 - 13,00 EUROS PROMOÇÃO SUPER ESPECIAL. BLOCO NOVO E MINT. SE NECES..
TCHECOSLOVÁQUIA - 1981 - BL-51 - 9,00 EUROS PROMOÇÃO SUPER ESPECIAL. BLOCO NOVO E MINT. SE NECESS..
TCHECOSLOVÁQUIA - 1985 - BL-67 - 22,50 EUROS PROMOÇÃO SUPER ESPECIAL. BLOCO NOVO E MINT. SE NECES..
TCHECOSLOVÁQUIA - 1985 - BL-69 - 22,50 EUROS PROMOÇÃO SUPER ESPECIAL. BLOCO NOVO E MINT. SE NECES..
TCHECOSLOVÁQUIA - 1987 - YV-2720/2721 - MINI FOLHAS - 12,00 EUROS PROMOÇÃO SUPER ESPECIAL. MINI FO..
TCHECOSLOVÁQUIA - 1988 - BL-81 - 7,50 EUROS PROMOÇÃO SUPER ESPECIAL. BLOCO NOVO E MINT. SE NECESS..
TCHECOSLOVÁQUIA - 1988 - BL-83 - 12,00 EUROS PROMOÇÃO SUPER ESPECIAL. BLOCO NOVO E MINT. SE NECES..
TCHECOSLOVÁQUIA - 1988 - BL-84A - 10,00 EUROS PROMOÇÃO SUPER ESPECIAL. BLOCO NOVO E MINT. SE NECE..
TCHECOSLOVÁQUIA - 1988 - YV-2767/2770 - MINI FOLHA - 25,00 EUROS PROMOÇÃO SUPER ESPECIAL. SÉRIE DE..
TCHECOSLOVÁQUIA - 1992 - BL-89 - 7,50 EUROS PROMOÇÃO SUPER ESPECIAL. BLOCO NOVO E MINT. 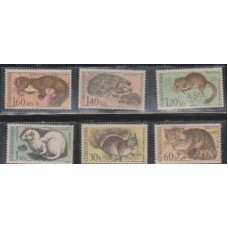 SE NECESS..
TCHECOSLOVÁQUIA - YV-1591/1596 - 9 EUROS - FAUNA GERAL NOVO (PERFEITO). IMAGEM DOS SELOS A SEREM E..
TCHECOSLOVÁQUIA - YV-1858/1863 - 6 EUROS - FAUNA GERAL NOVO (PERFEITO). IMAGEM DOS SELOS A SEREM E..